We recently commissioned a new (replacement) website. This was because our current (free) website does not enjoy the same flexibilities as a (modestly) paid for one. For example, we couldn’t add any new tabs and we were experiencing caching issues …..
I’m delighted to announce that our new web site is now fully functional and will be utilised from today. Hence we will no longer be posting to our old web site (www.battleofhatfield.webs.com) and are looking to de-commission this shortly. We have also taken the opportunity to re-think the, “look and feel” of our new site. We welcome your comments ! We have also transferred those still relevant data elements (blog posts, articles etc..) from the old site to the new one. 1/ “HLF Project 2018” … where you will soon see the LATEST timetable of events, it wil be posted by Friday 27th April. The events are due to take place very shortly … we expect our “Kick Off - Setting The Scene” to take place on Saturday 12th May at Cuckney Village Hall. Please try it now ! With regard to our Meeting next Friday 23rd March (Cuckney Village Hall @ 7:30pm). We are experiencing difficulties in loading our meeting Flyer to the bottom of the previous post. Can you please use the link below which will take you to a display of the flyer on our Facebook page instead. We appreciate this is not the ideal forum but crave your indulgence on this occasion. 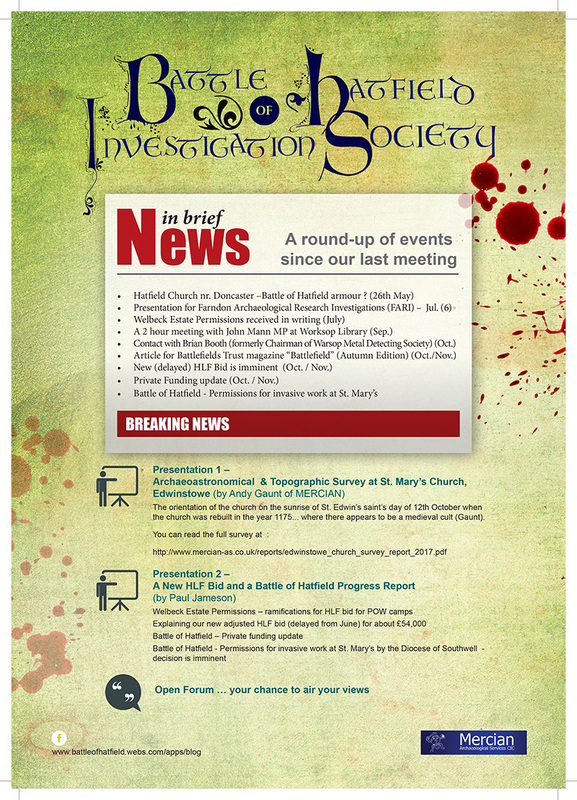 The Battle of Hatfield Investigation Society are delighted to announce a meeting with Rupert Matthews (MEP, East Mids.) - at St. Mary's, Cuckney – at 10am on Saturday 27th January. Rupert has also worked as a freelance writer and journalist and has written over 170 books – including some on history, ghosts, cryptozoology, UFOs, paranormal activity. He has recently been in contact and is keen to learn more about our history and aims. We are glad that he is showing such a keen interest and hope that his influence can further our cause re. Faculty Award and funding. We have arranged to gather at Cuckney Village Hall (FREE) Car Park at 10am. We would intend to “repair” (via walking) to the nearby Greendale Oak (public house) at noon for a final discussion & catch up (although I cannot guarantee that Rupert Matthews will be able to stay for that). Hence I will book a room for us all if there is enough demand. Post our A.G.M. of the 10th November, we thought it would be appropriate to let you know about our Faculty award progress. A major private company has been asked for £150,000 thanks to one of our supporters who has connections. This is mainly for Battle of Hatfield related activities at St. Mary’s, Cuckney (£125k) but also for further work at St. Edwin’s Chapel, Edwinstowe (£25k). Although the original decision was due at the end of September, we still await an answer. We really hope to have a Yes / No by Christmas. It was great news when the P.C.C. (Parochial Church Council at St. Mary’s,Cuckney) backed an excavation and formally submitted a Faculty Request to the Diocese on the 17th September. This was supporting excavation of our “Preference 1” (the large pit (by area) in the Eastern Central area of St. Mary’s. The Diocese then requested crucial supplementary documents relating to proposed working methods. So in late October we commercially engaged Malin Holst & Tim Sutherland (from York University) to provide the supplementary documents as Jo. Buckberry’s calendar did not allow for her participation. Malin & Tim cannot provide the supplementary information for either of the Diocesan meetings left in 2017 (November 13th & 11th December). BOHIS have asked them to provide this by Jan. 5th 2018 in order to be assessed by the Diocese on Monday 15th Jan. 2018. Malin Holst has also indicated that before she commences work upon the supplementary information that she would like the Diocese to comment upon the likelihood of a Faculty being issued. BOHIS do not really agree with this approach as we believe that a formal faculty approach is the best way of judging all of the evidence together and reaching the best, informed conclusion. However, BOHIS sent a request to the Diocese on Monday 20th November, asking the question. 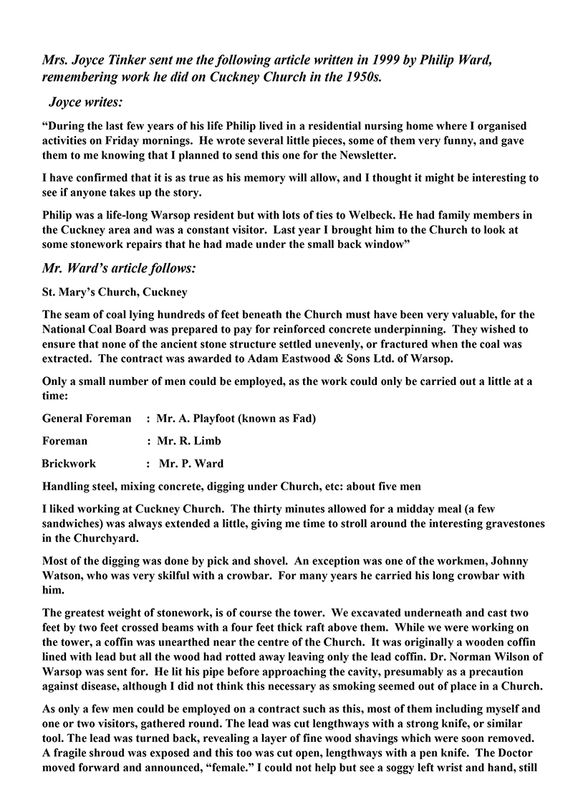 Thanks to his relative Mrs Joyce Tinker, we recently became aware of an article by Philip Ward, one of the workmen employed at St. Mary’s in 1950/1. 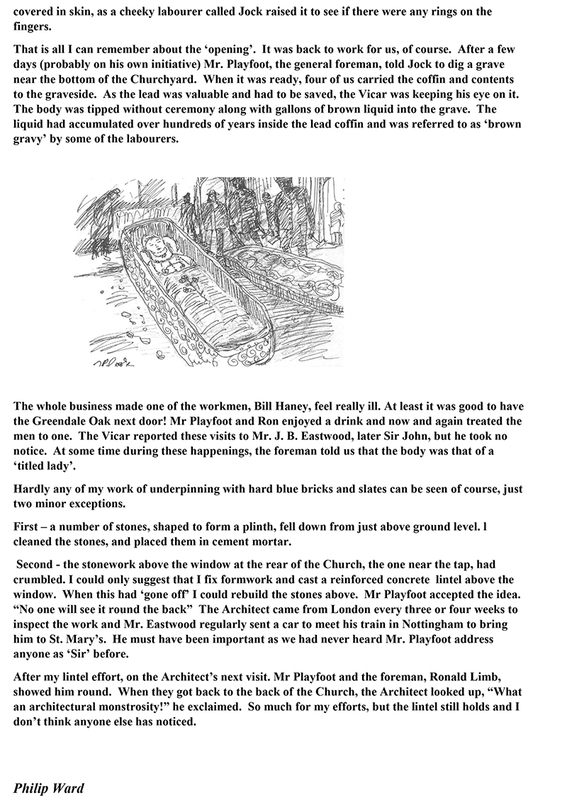 This was originally published in the Welbeck Newsletter (Summer 1999). We hope to provide this and a general letter detailing all of the evidence that might lead us to conclude that the Cuckney area does represent the site of the battle and that an excavation is likely provide compelling evidence – as an addendum to the Supplementary Information. Part of that persuasion will be ethical considerations. We believe that the article shows a lack of care regarding the reburial of a ‘Titled Lady’ in the same 1950/1 operations and displays other attitudes that might lead one to believe that the 200 or so skeletons discovered would have been treated in the same manner, necessitating a final reburial with dignity after excavation. 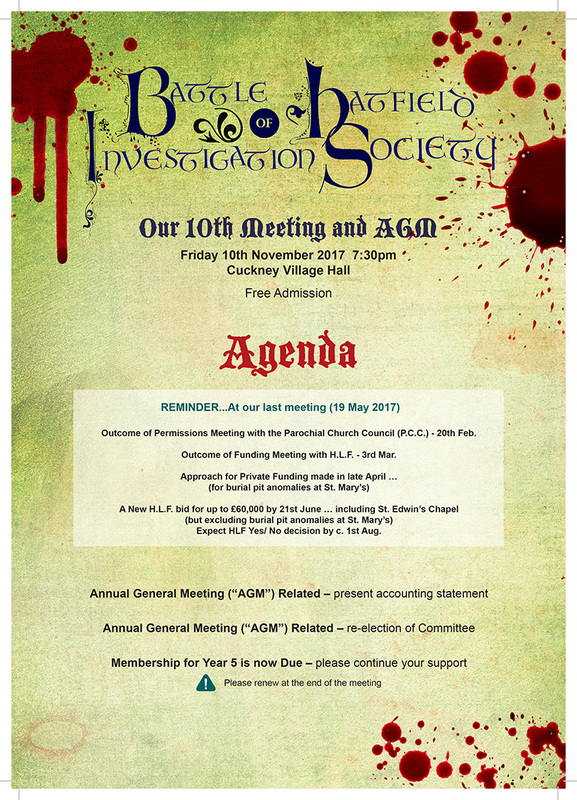 Just a reminder that our next meeting (and A.G.M.) is this Friday 10th November. For full Agenda please see post below. As told to our meeting on May 19th, having received initial support from the PCC on Feb . 21st for an application for a Faculty to the Diocese for a 1 pit analysis, we were then dismayed in March to be turned down for HLF funding re. invasive skeletal examinations at St. Mary’s, Cuckney. However, we promised (and were encouraged by the HLF) to submit another bid to the HLF by 21st June but this has now slipped to 21st August but is guaranteed to happen by then ! It will be for c. £60,000. As a necessary prelude to the new bid, having had our initial Project Enquiry (1,000 word web form) accepted, Jennie & I are attending an HLF “Small Grants Workshop” on Friday 14th July. This will then immediately enable us to start filling in the 6,000 word “Our Heritage” Grant form. We should then find out in about 6 weeks (early October) whether this has been successful. Due to the planning that will then need to take place (competitive tendering etc..) & with winter approaching it may be Mar 18 before this work takes place. It’s worth reflecting that the LIDAR will be a useful tool in pinpointing elements that could also have ramifications for the Battle of Hatfield related topics. In parallel, we have submitted a professional private funding bid for £150,000 to a local company, who have already reviewed this. It has not been turned down. However, they will not be in a position to give a definitive answer until approximately the end of August 2017. This would be to cover invasive work (ie. digging) at St. Mary’s re. skeletons that may be from the Battle of Hatfield (if we have been awarded the faculty). It is also for invasive work at St. Edwin’s Chapel (that may have been the temporary resting place of Edwin’s (headless) body from c. 632AD to a max. of c. 715 AD). It would be marvellous if this was in the affirmative and we hope it would enable the PCC Faculty Request to be made soon afterwards. Your suggestions are also very welcome. You may remember that we had an interview with Mansfield Radio 103.2 FM at the Greendale Oak (attended by 9 supporters / contributors) on the 30th January. Also, I'd like to remind you that we have a meeting at 7:30pm this Friday (19th) at Cuckney Village Hall (free admission). Please come along and support the project.